This feature is not required for core development but it makes a range of enhancements possible for plugin developers. In this case, flooglegrobs and manglebleebs are special features that are not available (a) as part of standard HTML, or (b) via Moodle filters. They are only available within specific fields of the specific editor, which receive special processing on input/display. So we do not want to add them to the general editor settings and have them appear everywhere. I don't want to waste too much time going into detail of why we want this but suffice to say it is sometimes necessary. For a practical example of a flooglegrob, which is actually in no way related to the plugin I'm writing, you could imagine something like a quiz question in which it is possible to insert special placeholders that the quiz question (and only that specific type of quiz question) will use. Maybe the placeholders have complex options so we want to make a nice dialog to insert them rather than just typing square brackets or whatever. Then, obviously you don't want these buttons to appear everywhere systemwide, because they are only applicable in that question type. Callback, global variable, CSS button hiding, ugh. If there are a lot of plugins like this then our global editor configuration is hard to read/modify. If there are a lot of plugins like this in a particular instance (especially if it's more than just flooglegrobs and manglebleebs) then we might want to redesign the editor layout for that location, i.e. move other controls around to make space for them. 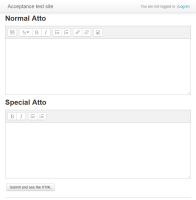 In order to solve this problem elegantly and without major code changes, I suggest that it should be made possible for a plugin to override the global config setting that lists the Atto toolbar items on a per-editor basis. This is extremely simple and appears to work. If we respect the user's preferred editor setting and the user has chosen a different editor then they will not get the plugins or the custom configuration. True, but this is inherent in the very idea of implementing editor plugins for functionality like this. We would still like to be able to do it for our custom plugin. This probably wouldn't be an appropriate way to do it for core Moodle. This is a bad way of implementing, the more general concept of a 'reduced' or 'compact' editor profile where you can have an editor with fewer buttons. True, but that's not what we need for this situation; having a compact editor profile wouldn't help us implement flooglegrobs, let alone manglebleebs. So far as I can tell (admittedly I've only done a rather minimal example) this is basically a five line code change, which you can see in the attached. I made a Behat test and associated fixture to demonstrate it working. You can see what it looks like in the attached screenshot. There was nowhere very clear to document editor options. I've added documentation (including for the existing editor options) to the phpdoc within the Atto use_editor function, and also added a hint to the base class use_editor function so that people might go look there!